Newly-elected Republican National Committeewoman Pat Anderson is at odds with her party over a move to lobby for expanded gambling at Canterbury Park. Newly elected Republican National Committeewoman Pat Anderson is in conflict with her own party over a move to lobby for expanded gambling at Canterbury Park. Anderson, who was elected to the RNC post less than two weeks ago, told the Star Tribune that she officially registered to lobby for Canterbury Monday. The track has been pushing to add slot machines to its operation – or a “racino” – for years. But the move is in direct conflict with the platform of the state Republican Party, which opposes expanding gambling. GOP Party Deputy Chairman Michael Brodkorb told the Star Tribune that Anderson should step down from her RNC post if she continues to lobby for the track. 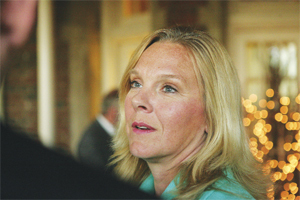 Anderson, who is a former State Auditor and lost a bid to reclaim the seat last fall, said it’s a free market issue, arguing her goal is to break the monopoly that the 11 tribes in Minnesota have on gaming. She said party activists are also split on gaming.